Congregations will strengthen their relationships with each other to foster greater affection, understanding, and mutual sharing. Conference activities will equip congregations to be spiritually and biblically grounded, led by Spirit-filled leaders, and telling stories and celebrating God-with us. Each congregation and its members will grow in capacity for God-centered worship, Christ-like love, and reaching out to their neighbors in Spirit-led witness and service. Jesus Christ is Lord and Savior. This simple confession unites the church across cultural, national, racial, denominational and every other human-made boundary that separates people from each other. As one, the church proclaims faith in Jesus for salvation from sin and service to God. Jesus is a person, the fullest expression we have of our Creator and the original intent for the salvation of the world. We follow this Jesus whom God sent into the world (Colossians 2:6). Jesus is not a theology or belief construct. While Jesus is not bound by Anabaptist traditions, we believe the Anabaptist stream of faith contributes to a deeper understanding of what it means to follow Jesus here and now. We are shaped over time by what we pay attention to and the habits we form. Thus we want to pay attention to and enact several spiritual practices that will continually bend us toward Christ, and form us over time as Christ followers. These practices help us stay centered on Jesus even in the midst of differences. This vision proposes we agree to be accountable to one another for implementing the following set of common spiritual practices. These practices are currently embedded within our Confession of Faith (related COF article numbers listed after each). We will worship God as the central act of our common life whenever gathered (COF 1, 9). We will practice prayer, fasting and generous giving (COF 18, 21). We will prayerfully study the Bible together whenever we gather to increase our competence in reading, interpreting, and applying the scriptures in an Anabaptist perspective to our everyday lives and to issues we face in the world (COF 3, 4, 15, 17, 18). We will accept and offer hospitality, believing it creates the context for God’s kingdom to appear in our midst (COF 10, 18). We will study the Bible with neighbors and strangers, inviting them to become disciples of Jesus (COF 10, 8). We will practice peacemaking by extending loving-kindness and forgiveness (COF 17, 22). We believe that by committing ourselves, together, to work at these spiritual practices, God will bring transformation toward Christ-likeness and renewal by the Holy Spirit. Communal biblical discernment is another spiritual practice; it is a discipline for us to listen to the Spirit, scripture and one another, to exercise patience, and to come to common understandings. 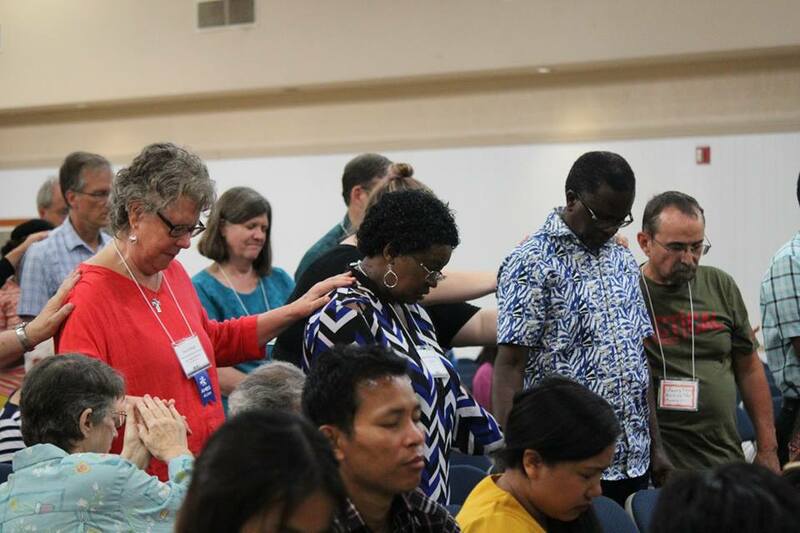 The covenant asks us to commit to: engaging the shared spiritual practices, to participate in conference affairs (via volunteers, delegates, finances, prayers, and communications), to use the communal discernment process as needed, and to foster inter-congregational relationships. This covenant will help us to maintain accountability and create an environment of trust as we, the community of congregations, commit and periodically recommit to the relationship. Does it take some effort? 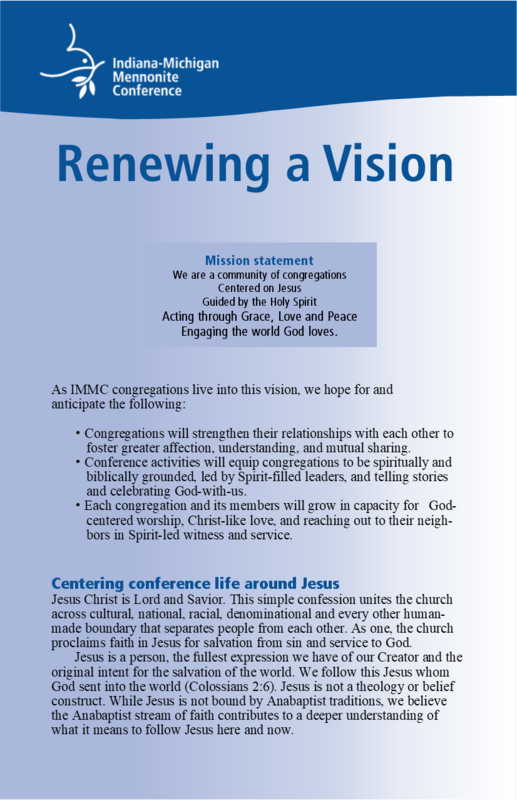 Yes, but we believe there is benefit to intentionality as it helps us be mindful of our voluntary commitment to the people, congregations, values and spiritual practices of IMMC. When we commit to an connect with those who know and care whether we succeed, we are better able to effectively serve our communities and the world, to the glory of God. 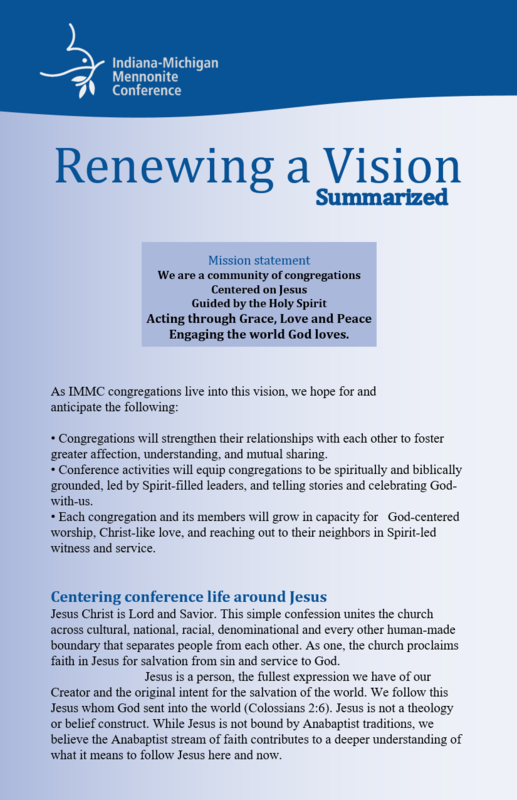 Learn more about how Renewing a Vision came to be.